Light for Daylily Varieties: Full sun to partial shade. Daylily (Hemerocallis) can be planted in sunny locations on any kind of soil, giving permanent pleasure from year to year. Consider planting over spring-flowering bulbs to hide the bulb's foliage as it matures naturally, while adding late spring color to your garden. Find all Daylily varieties for fall shipping here. 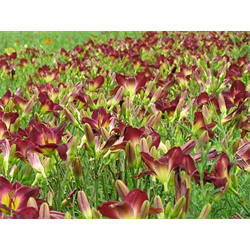 Pricing is per package and per variety for daylily bulbs (quantity discounts apply).